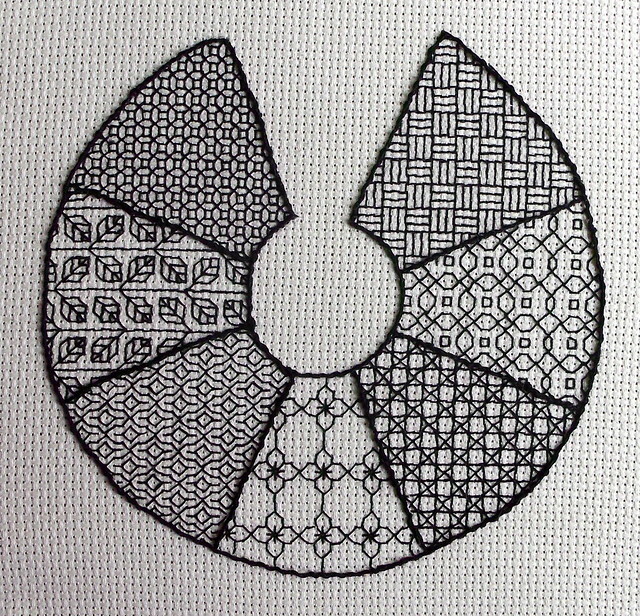 I finished up the blackwork sampler just now. I don’t know what I was thinking when I did the stem stitch outline — I know I had a lot more trouble working it one-handed than I did the filling stitches, but that doesn’t explain why I made all these crazy long stem stitches. But I whipped the outline with #8 perle cotton, and it’s looking much better now. The whole thing could have been improved by having been worked in #8 perle cotton, I think. But I started it pretty much on the spur of the moment, and I grabbed what was handy at the time, which was a ball of crochet/tatting thread since I had my vintage thread stash out since I’d recently done the hair on the rag dolls. I think that stuff is size 70 based on a web search (no size on the label). The stitches are a little wonky in places where a couple of stitches had to come out of the same hole, and I think in perle cotton it would have all squooshed together more nicely instead of the threads trying to elbow each other out of the way. Live and learn, right? I have this idea for a t-shirt with a blackwork design on it. I’ve been trying to find out if there are any dissolving stabilizers with a grid pattern. I have a roll of Sulky Sticky Fabri-Solvy, which has these sort of little dimples in it, so if I can’t find something with a grid that would probably work. I’m taking liberties with the pattern to try out some new things. A little while back I read a review of Jacqueline Enthoven’s The Stitches of Creative Embroidery at &Stitches and decided to pick up a copy of it. I’m really glad I did — there’s so much great stuff in this book. This is the first time I’ve ever actually read a stitch dictionary straight through. There’s all this really neat historical info in with the stitch descriptions, and there are a ton of things I’ve never seen before or wouldn’t have thought to try. The green leaf in the corner and the yellow leaf to the right are two of the things I wanted to try out. 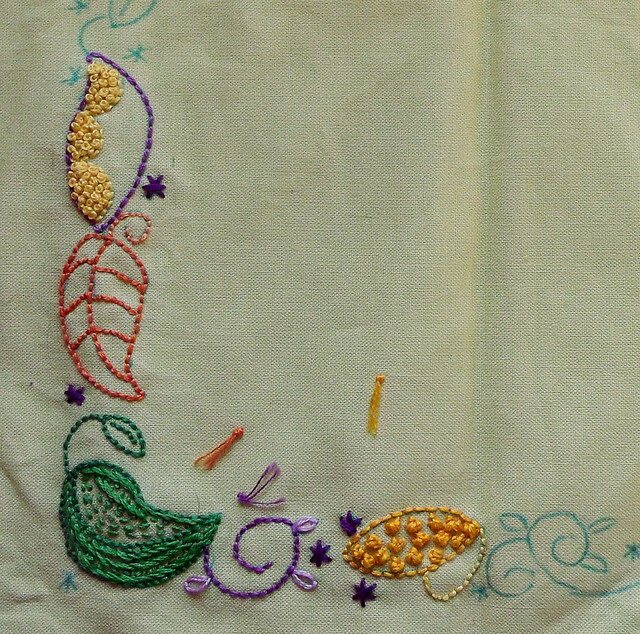 The green leaf uses the French filling stitch described in the book, alternating rows of stem stitch and running stitch. The yellow leaf is filled with raised cross stitches, though I’m not entirely sure I did them right. Before I go any further with it, I need to rework some of the little stars (I was sleepy when I did them, and it shows!) and deal with those away knots that are piling up. I’ve been putting off doing the purple one — see how I only left myself a little bit of room? Not sure what I was thinking there!